A part of the well-known Life in Philadelphia series drawn by Edward W. Clay, this racist caricature lampoons free African Americans’ celebratory response to the abolition of slavery in the British colonies in 1833. 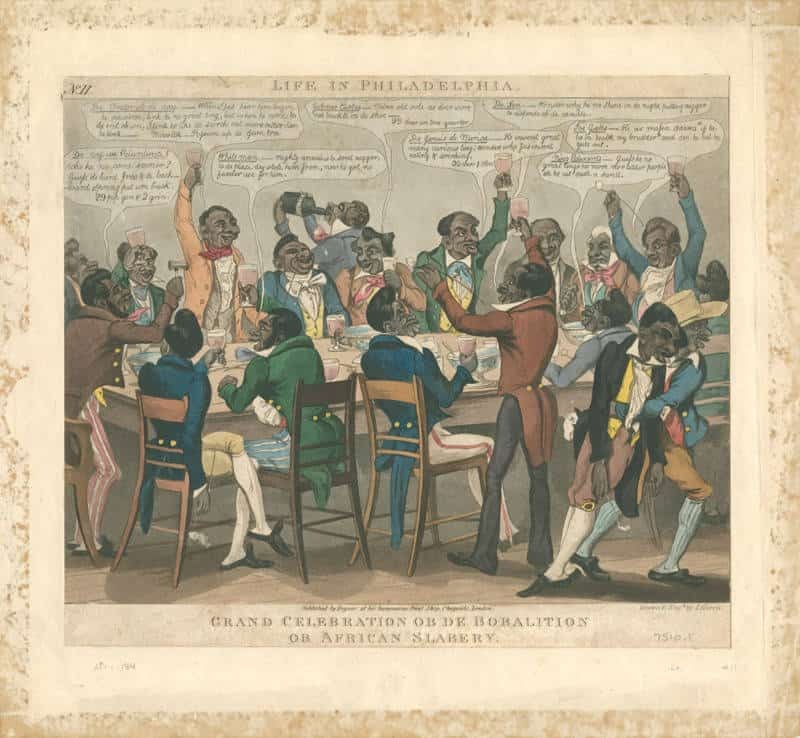 “Grand Celebration,” like Clay’s other drawings in the series, mocks the pretensions of free blacks who (according to many whites) were poorly “ape-ing” the customs, manners, and dress of middle- and upper-class whites. This image is one of many produced in the antebellum North that amplified animosity towards the ascension of free blacks out of slavery and into greater strata of wealth and status (see also “Reply to Bobalition of Slavery”). The satirical use of a “black” dialect, in contradistinction to the fanciful costumes of the men, underscores the widely held (though not completely uncontested) belief by antebellum northern and southern whites that African Americans could never truly rise out of slavery.